Canadian cuisine has a full range of tastes, from purists offering traditional fare to bold adventurers who create new flavours and experiences by fusing together different ideas. Of course, it all pairs well with Canadian wines and craft beers. Savour the flavours while cruising down the St. Lawrence River. Sampling the best of wines can become a tour of it’s own. Ask you Canadian Insider to personalize a tour for you. Poutine anyone? Québec’s culinary contribution extends far beyond its signature dish of fries, cheese curds and gravy. Foodies find plenty to savour in La Belle Provence - from the cheeses along the Eastern Townships’ route des fromages and the traditional Québecois meat pie called Tourtière, to legendary Montréal smoked meat sandwiches. And in increasingly multicultural Québec, you’re as likely to taste fresh couscous as you are tire d’érable, taffy made from pouring boiled maple sap onto fresh snow. Bon appetit! Celebrating life is always made better with the best flavours of the region. Vancouver also hosts several culinary institutes where chefs hone in on their craft to the taster's delight. Canada’s West Coast cuisine is all about fresh, healthy ingredients and Asian fusion. Wild Pacific salmon and locally harvested seafood such as spot prawns and Dungeness crabs form the basis of many signature dishes. From there, chefs get very creative, riffing on everything from BC Roll sushi and Salt Spring Island lamb to butter chicken pizza and Indian lamb popsicles. Many of our trips begin or end in Vancouver, where we’ll ensure that you taste the best of the west coast. If the Okanagan’s scenery doesn’t seduce you, the gourmet farm and orchard to table cuisine paired with sensational local wines will. All we can say is cheers to that. Some of the Okanagan wineries offer full tours inclusive of storage methods, vineyards and the sampling room. Canada's second-largest wine producing region also just happens to be one of its most scenic. Surrounded by pine forests, lakes and provincial parks and ski resorts, the Okanagan is to Canada what Napa Valley is to California. Wine touring here is a bucket-list activity. 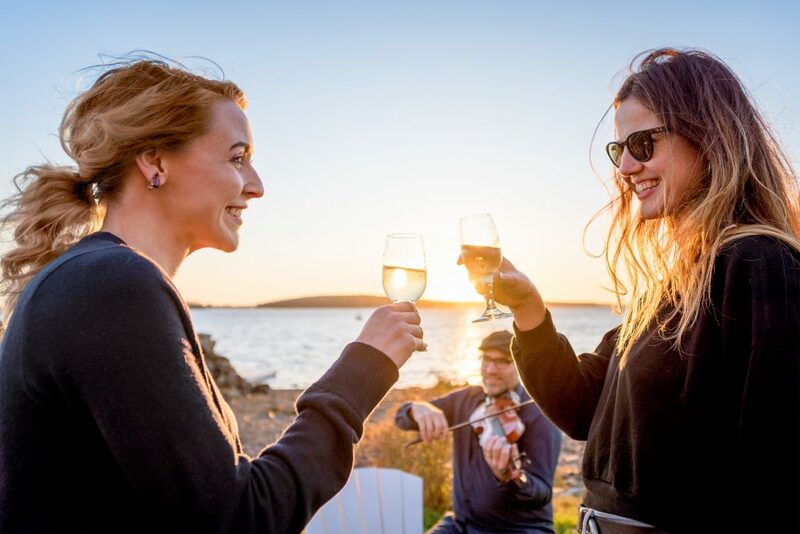 Whatever your palette, we can uncork an itinerary for you that will have you tasting and toasting your way to a fantastic vacation. Winery tours are popular in the Niagara Peninsula, part of Canada’s largest wine-making region. We know the best wineries and can help you create a customized tasting tour. At roughly the same latitude as Northern Italy, the Niagara Peninsula is perfect for growing a wide variety of grapes. We recommend spending at least a day here. Touring award-winning wineries, meeting seasoned winemakers and tasting fine vintages. Sounds like the perfect vacation? In the Niagara Peninsula region, dozens of vineyards produce a huge variety of international award-winning red, white, rosé and sparkling wine, plus specialities like Icewine. That’s why we ensure that this international centre of wine-making excellence gets prominent billing in several of our customized tours.